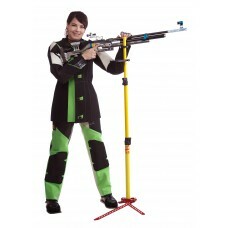 Designed so that the shooter can place the feet very close to the Rifle Stand, so that only a minimum of movement is needed to move the rifle into the firing position. Supplied with an intelligent ammo tray: On one side are holders for 2 x 50 small-bore cartridges, on the other side there are locations for airgun pellets – either a metal tin of 500 or a match box – and there are holders for screwdrivers etc. Total maximum height 150 cm. Quick to setup, under 15 sec time needed. Requires little space. The feet can be folded in and telescopic fibreglass tubes slide inside each other. The vertical tubes are made of fibreglass, resulting in an extremely low weight, 1.5 kg!